Did a 38-Year-Old White Active Duty Naval Officer Assault a Black Middle School Student? - Truth or Fiction? A viral social media post details a June 2018 incident during the North American Sand Soccer Championship in Virginia Beach. 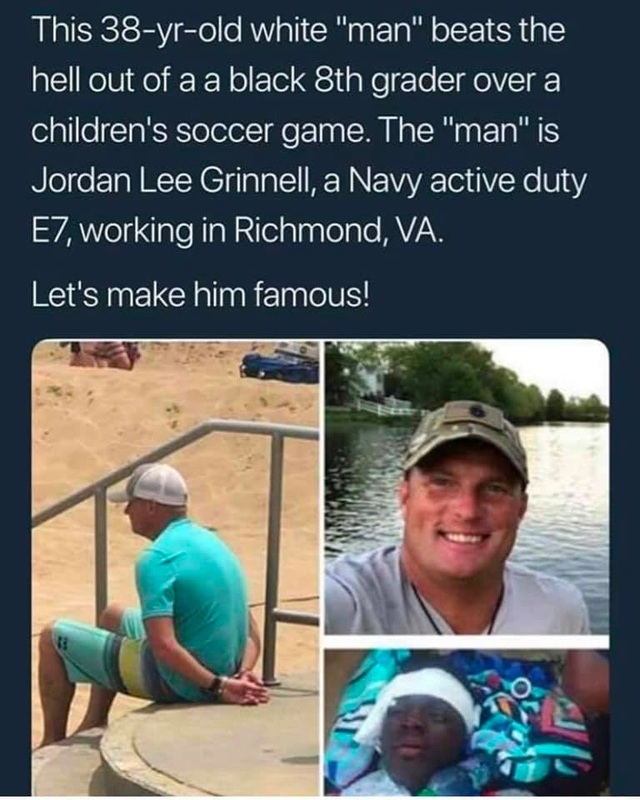 Active duty Naval officer Jordan Lee Grinnell assaulted a black middle schooler. This 38-yr-old white “man” beats the hell out of a a black 8th grader over a children’s soccer game. The “man” is Jordan Lee Grinnell, a Navy active duty E7, working in Richmond, VA. In the space of a few weeks, the post was shared more than 100,000 times. A search of Facebook revealed an identical post (not in screenshot form) posted in July 2018. That post did not garner many shares or much engagement. The claim dated back at least that far, and an iteration of it appeared on the message board Democratic Underground along with a tweet. The tweet displayed tens of thousands of engagements in the form of shares and discussion. As it happened, there was extensive news coverage of an incident involving a man named Jordan Lee Grinnell from June 2018. On June 15 2018, The Virginian-Pilot reported about an altercation at a soccer game that month, which apparently began when two boys on opposing teams got into a fight. Near the end of a sand soccer game [in June 2018] at the Oceanfront, two boys on opposing teams began pursuing the ball. After it went out of bounds, a brawl broke out between the two. What happened next stunned onlookers, and left some of the players who witnessed it feeling fearful and traumatized. It also led to a hospital visit and stitches for one of the teens, and caused police to arrest the father of the other player. Jordan Lee Grinnell, 38, of Virginia Beach, was charged with misdemeanor assault, police said. He was released on bond afterward. It happened at the annual North American Sand Soccer Championship. More than 10,000 players, age 8 and up, participated this year, said Lauren Bland, executive director of Hampton Roads Soccer Council. Witnesses said they saw Grinnell knock a boy to the ground and punch him in the face. Timothy Vickerie, 14, of Chester, received four stitches above his right eye and suffered a concussion and bloody lip, according to his mother, Nicole Vickerie. When the eighth-grader returned to the tournament the next day to cheer on his teammates, his eye was swollen shut and bruised. Nicole Vickerie said it appeared her son was about to grab the other boy’s shirt when Grinnell ran over and punched him, knocking him off his feet. Moss said he [sic?] called police and confronted Grinnell. Police say a soccer player was assaulted while playing at the North American Sand Soccer Championship on June 9 . A Navy chief who allegedly charged into a youth soccer game as his teenage son jostled with his opponent is being charged with assault and battery, the Virginia Beach Commonwealth’s Attorney’s Office told Navy Times. Chief Engineman Jordan Lee Grinnell, 38, was arrested by Virginia Beach Police last month after he reportedly knocked Timothy Vickerie, 14, to the ground and began punching him in the face. Vickerie was hospitalized with a concussion and required four stitches, the report said … Grinnell has no prior criminal record, the Pilot reported, and his Navy records show that he’s the recipient of five Good Conduct Medals. A Navy chief who charged into a youth soccer game and beat up a 14-year-old boy made a scheduled court appearance [in October 2018], where he pleaded no contest and was found guilty of assault and battery, the Virginia Beach Commonwealth’s Attorney’s Office told Navy Times. Chief Engineman Jordan Lee Grinnell, 38, was sentenced at the Virginia Beach Juvenile and Domestic Relations Court hearing to 12 months in jail, with the entire sentence suspended except for 60 days. He will be allowed to serve out the 60 days in jail over the course of 30 consecutive weekends, starting Oct. 19 . Multiple attempts were made by Navy Times to inquire what punishment, if any, Grinnell received from the Navy but officials would not specify exactly what ramifications he is facing. “The Navy is following our administrative protocols regarding civilian convictions,” Lt. Cmdr. Jessica McNulty, spokesperson for Navy Recruiting Command, told Navy Times. 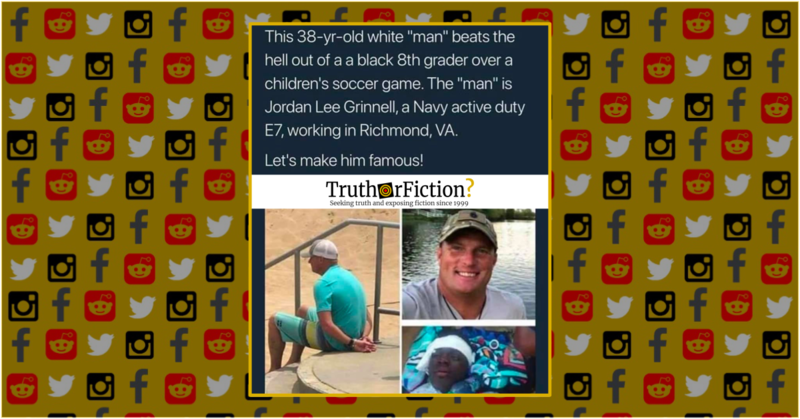 The January 2019 Facebook post claimed that active duty Naval officer Jordan Lee Grinnell “beat the hell out of a black 8th grader at a children’s soccer game.” Grinnell, 38, was found guilty on assault and battery charges stemming from an incident at a June 2018 soccer game in Virginia, resulting in injuries to a 14-year-old boy. However, the incident received extensive news and social media attention when it occurred in June 2018, and Grinnell was arguably already “famous” when the claim was re-shared in early 2019. The story is true.